North American Wave Engine Corporation (NAWEC), an aerospace company formed from research based at the University of Maryland, College Park, has received a $1.45 million investment in a funding round jointly organized by the recently established University System of Maryland (USM) Momentum Fund and the Abell Foundation, a nonprofit dedicated to the enhancement of the quality of life in Maryland, with a particular focus on Baltimore City. 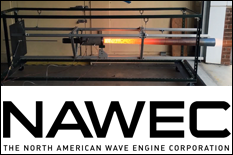 NAWEC has ground-tested its first series of prototype engines for the General Aviation and UAV markets, and is moving toward flight-testing at the UMD Unmanned Aircraft Systems (UAS) Test Site in Southern Maryland. The company is also working with established aircraft manufacturers and government agencies to bring its first product to the market. "We are grateful to the USM Momentum Fund and the Abell Foundation for their support as we continue to push the boundaries of science, engineering, and aviation,” said NAWEC CEO Daanish Maqbool, who earned his Ph.D. at UMD’s A. James Clark School of Engineering, where is he currently a lecturer. Following his undergraduate degree at MIT, Maqbool selected UMD’s aerospace engineering department for its reputation, prominent faculty members, and the high-quality research and funding opportunities. For his graduate research, Maqbool worked on a NASA project focused on advanced rocket engine cooling methods. The company will use the funds for flight testing at the UMD UAS Test Site and for office space at TechPort at The Airport, a new startup incubator, both located near the Naval Air Station Patuxent River St. Mary’s County, Md. “We’re excited that this innovative technology is expected to seed a new industry that, looking ahead, will create manufacturing jobs in Baltimore,” said Abell Foundation President Robert C. Embry, Jr. The USM is the state’s public higher education system. USM’s 12 institutions, two regional higher education centers, and system office work closely together to leverage their collective expertise and resources, share best practices, increase the system’s effectiveness and efficiency, and advance USM’s mission to improve the quality of life in Maryland. With a $10 million commitment from the USM already in place, the system is collaborating with UM Ventures to reach out to area venture capitalists and angel investors for an additional $15 million. UM Ventures is a joint initiative of UMB and UMCP to commercialize technologies and expand industry collaboration. The Abell Foundation is dedicated to the enhancement of the quality of life in Maryland, with a particular focus on Baltimore City. The Foundation places a strong emphasis on opening the doors of opportunity to the disenfranchised, believing that no community can thrive if those who live on the margins of it are not included.